Maurizio Cossutti and Alessandro Ganz return to work with the Estonian yard Ridas Yachts based in Tallinn on a new racer-cruiser boat. Based on the design of the one-off built in 2015 by the same yard, the new model has been innovated in hull lines and appendages. The new One Off 37 design come from her predecessor Katariina II, the one-off racing boat developed by Ridas Yacht and Cossutti Yacht Design in 2015 for the ORC races.Indeed the two boats share the deck design and a similar interior layout, but the real innovations are the hull lines and the appendages which has been modified on the owner request to differentiate the two projects. The new hull presents narrow and vertical V sections at the bow, in order to gain seaworthiness and have a smoother passage through the waves. Between the forward and the midship perpendiculars, the geometry pass from a V to a rounder shape and the bottom becomes flat. After the midship, the sections tend to be flat at the centerline but then they go up immediately toward the sheer line to save some wetted area. The deck has been designed for the best ergonomics for racing with a large cockpit and the big wheel located in a central position; the narrow and low coach roof has been designed to guarantee the best movements around the deck and a low aerodynamic resistance. The interiors are all structural, in fact they have been designed to integrate the hull structure and to guarantee the proper longitudinal and transversal stiffness, the materials used have been calculated to guarantee the best weight distribution using the light composite panels at the extremities and solid marine plywood in the central sections of the boat. Hull and deck have been infused using only unidirectional glass fibers in order to obtain the best results in terms of stiffness, weight and costs. The sandwich panels of hull and deck have different pvc characteristics depending on the area where they are located: for instance, at the bow sections, where there are the highest loads due to the slamming, a combination of high density PVC and single skin have been used. 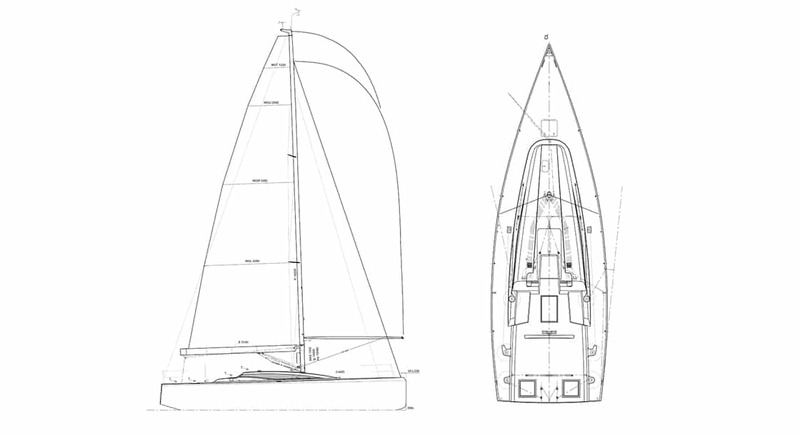 The boat is fitted with a carbon mast and the sailplan has been developed in collaboration with the north sails designers and optimized with the CFD techniques.